SOLARMETER® 8.0 - Radiomètre UVC pour lampe Germicide. Silicon Diode (SiC) Photodiode in hermetically sealed UV glass window cap. 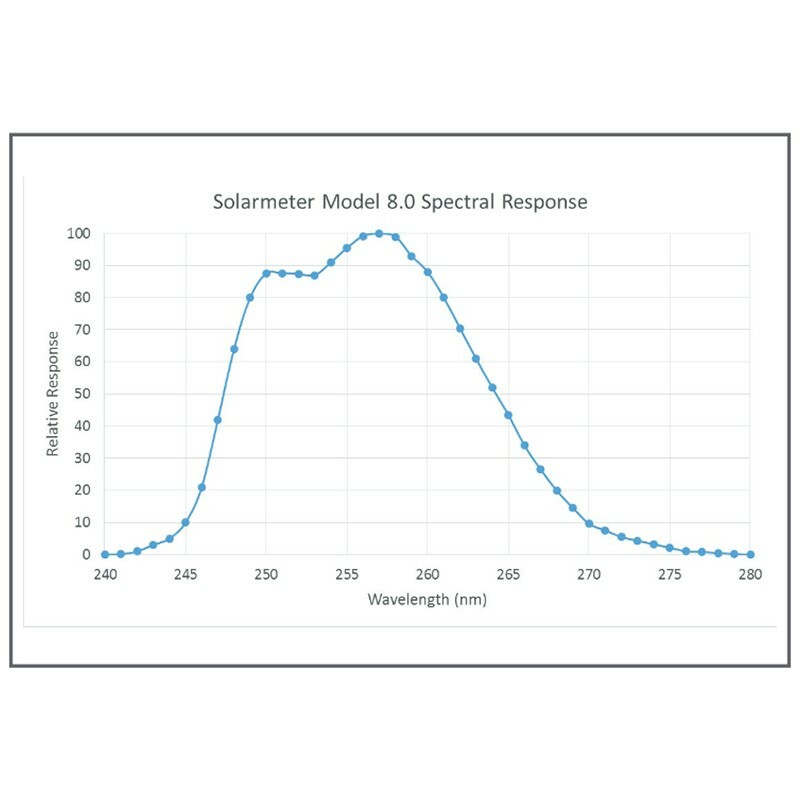 Interference filter blocks UV above 280nm as shown on Spectral Sensitivity Graph. 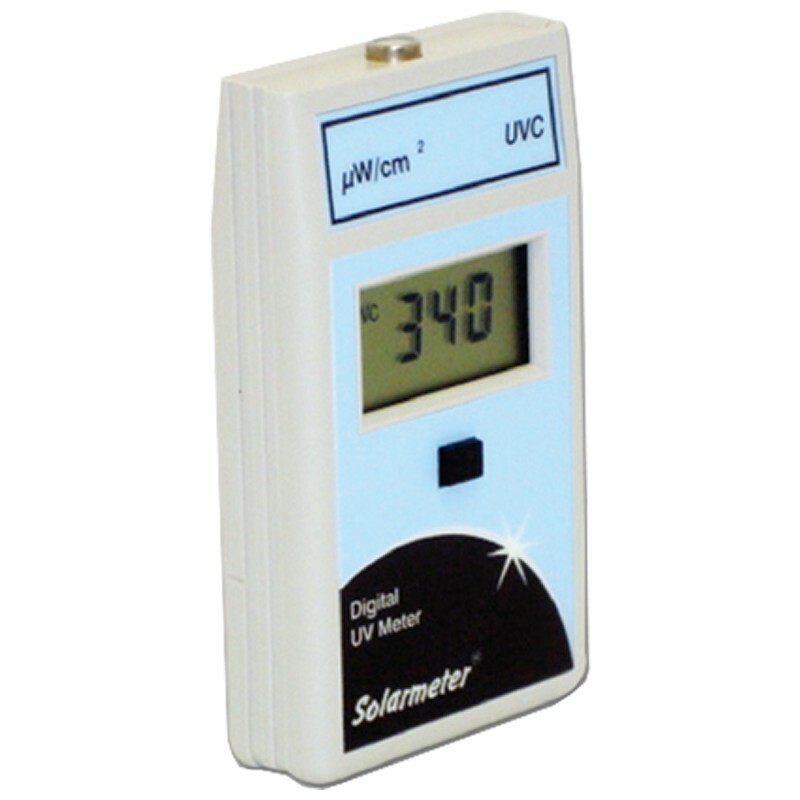 To operate your Solarmeter, aim the sensor window located on the top panel of the meter directly at a UV source. Press and hold the push-button switch on the face of the meter. For best results take note of the distance the reading was taken from the UV source in order to ensure repeatable results. • When checking UVC sources, wear face, hand, and eye protection and cover any skin that may be exposed. • Allow lights to warm-up prior to taking readings (at least 5 min). • For individual light intensity, hold meter close to LED or lamp. • For effective light intensity, hold meter at working distance from the light source. • When checking aging of lights, keep measuring distance and locations constant. • Lights should be replaced when output drops to about 70% of their original (new) readings. NOTE: Sensor is completely solar blind to UVB, UVA, visible and IR. Meter will read 000 pointing at non UVC sources including sun, flood lamps etc.